Hand-drawn, laser-cut jewelry pendants that come attached to the metal plate from which they were cut. Dimensions (in packaging): 4.25" x 4.25" x 0.3"
Melissa Borrell merges industrial techniques and organic designs to create remarkable metal jewelry that starts out flat and only reveals its final form when you pop out the shape. It’s fun, contemporary and, since it’s made by lasers, it’s literally cutting edge! 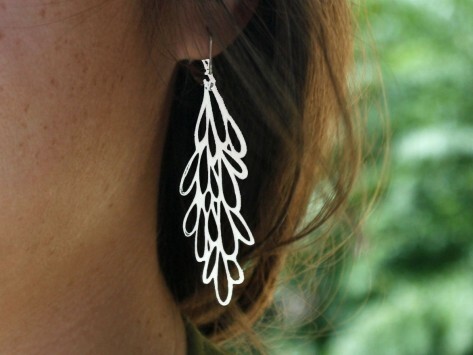 Melissa, who earned her master’s degree in jewelry design from RISD, hand-draws each design, which is then cut onto a sheet of metal but not detached from it -- that’s the fun part. Her Pop-Out pendants, necklaces and earrings are available in 18k gold-plated metal, stainless steel and red powder-coated steel (the ear hooks and pendant chains are made with sterling silver or 18k plated silver). Each can be worn singly or layered together to create your own custom look. When you layer the pieces, the interplay is mesmerizing -- like red that glows gold, or silver with a red shadow. It’s wearable art. We found out about Melissa’s designs through one of our favorite blogs, Ree Drummond's The Pioneer Woman, and we knew it would make a great Grommet. It’s an ideal gift, too. Just imagine the surprise as your recipient discovers how to turn Melissa’s flat metal sheet into sculptural jewelry. So whether you want these for yourself or for someone else, get ready for pop-out fun. Twist, pop and enjoy!